Since Gavin Newsom, the Democratic candidate for governor of California, proposed free health insurance for illegal immigrants, the state’s gubernatorial election has quickly become a referendum on its sanctuary policies. “I did universal health care when I was mayor [of San Francisco], fully implemented regardless of pre-existing conditions, ability to pay, and regardless of your immigration status,” Newsom said on the left-wing Pod Save America podcast on Aug. 28. Newsom is currently California’s lieutenant governor. “San Francisco has the only universal plan for undocumented residents in America. I am very proud of that. We proved that it can be done without bankrupting the city,” Newsom added. Newsom’s proposal was sharply criticized by President Donald Trump on Sept. 6. 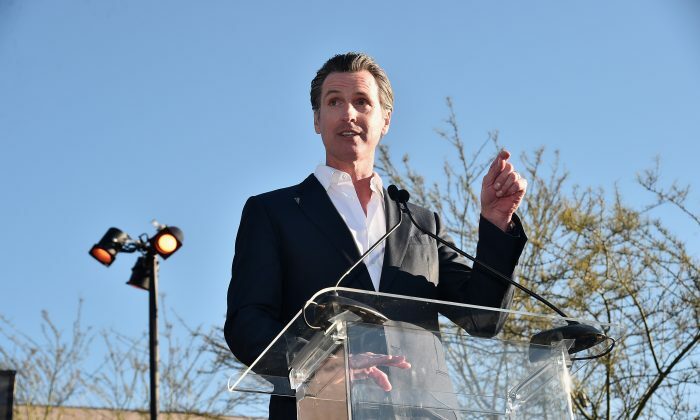 With California facing budget shortfalls in education, infrastructure, and affordable housing, Newsom’s plan to assist illegal immigrants may become a focus of opposition to his candidacy. Newsom’s proposal also was criticized by his gubernatorial opponent, Republican candidate John Cox. Cox says he’s concerned that Newsom wants to spend money to offer free medical insurance to illegal immigrants, while the state is short of needed funding for education, as well as for water storage and infrastructure. Cox was endorsed by Trump in a tweet on May 18, while Newsom has labeled himself as the leader of the liberal resistance to Trump. “I’m not just running to be the head of the resistance. I want to be a positive alternative to Trump,” said Newsom on Aug. 11, according to the San Francisco Chronicle. Newsom has been the front-runner in the race. In January, Newsom took to his Facebook page, to call on Trump to resign, the Los Angeles Times reported. California has led the nation in adopting sanctuary state policies, and the Trump administration has pushed back, filing a lawsuit earlier this year against the state that alleges obstruction of federal immigration enforcement.